A subtle difference in shade of meaning, expression, or sound. Being black in America has never been easy, but how we are seen and represented has certainly evolved. Who we are and how we see ourselves has likely always been a bit nuanced to the way the rest of America chooses to identify us. As a collective of diverse people, we are all human beings, are many things at once; never holding just one identity at a time but encompassing many on our individual journeys through life. Considering that our family trees are littered with unknown identities of unknown specific origin and missing culture it is difficult to pinpoint just one type of identity anyway. When just four generations or less ago one’s great great great was a slave, it is very important to acknowledge that we aren’t that far removed from slavery. It may have lasted 400 years but we are only half of that time removed from it so the after effects of it dwell in the American psyche and if you choose not to acknowledge that you are kidding yourself about the reality of the times. So don’t be surprised at how our experiences as a community maintains racial challenges in America because as a country we have some ways to go. Being American shapes my identity in many ways especially culturally. Both my parents are black and were born in America, and so are their parents. The lineage has other facets to it but as a black person it is challenging to traceback your lineage to know all there is to know about your ancestral origins. Most of the information is passed down through word of mouth and privately kept records throughout the family. Your identity of yourself versus the image people view you under are two different things and are often not parallel or similar when it comes to such perceptions. Consider this, every perspective is built on things we think we know versus things we actually experience or are certain of. We are conditioned to generalize in a way that disadvantages ourselves and others. We consider the extremes more than we consider the vast number of in-betweens. Those in-betweens are the nuances that make our images match our identities more and more. And exposure to these things are so very important. So much content exists today that powerfully and unapologetically expresses, highlights, and exposes the many nuances of black people today and how we as nuanced black people sometimes subscribe to those generalized narratives of ourselves. 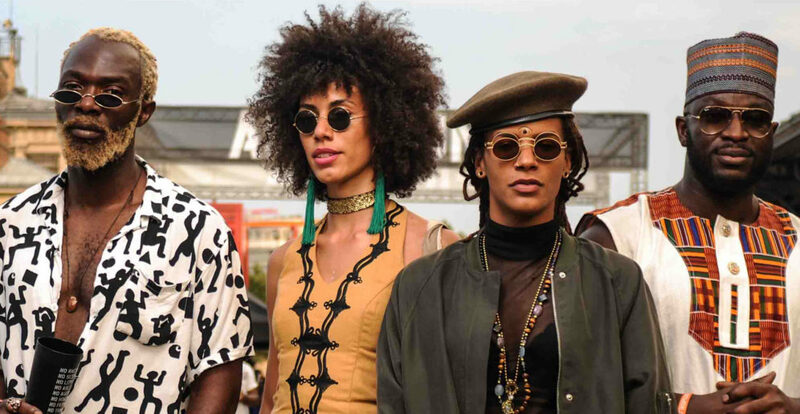 Here are just a few of the many unapologetically black shows that highlights the non-monolithic identities of the African diaspora in America. They also a variety of narratives of our identities and experiences. One of my favorite shows that premiered in 2018 is Random Acts of Flyness. 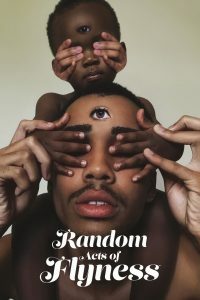 It shares the contemporary black experience and its many nuances all from the surrealist workings of creator and star of the show Terence Nance. 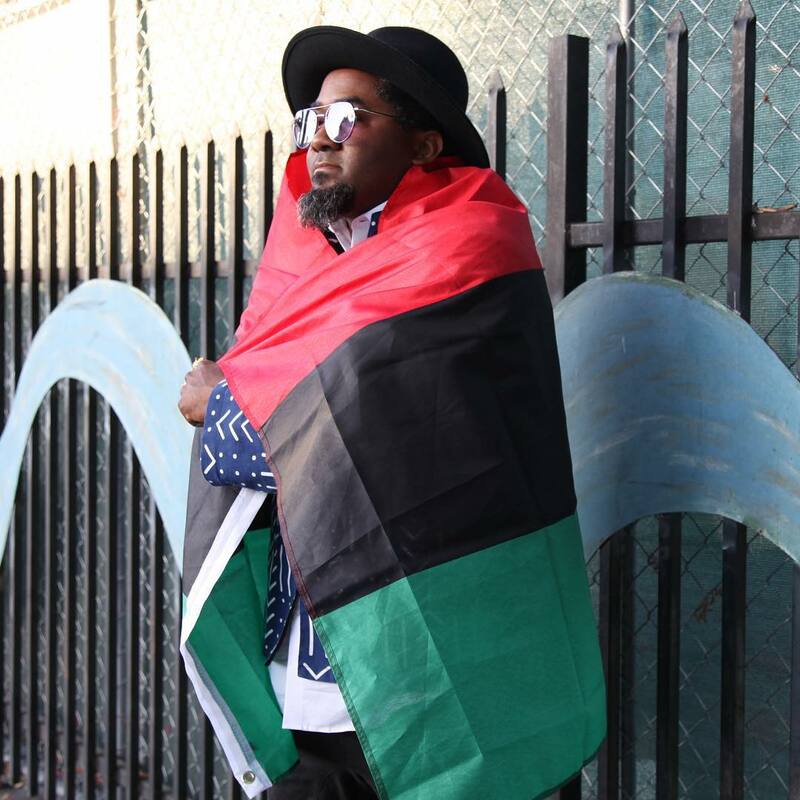 It is not only empowering but it allows those who don’t know what it’s like to be black to get a glimpse into what it feels like while validating the experiences we live through as black people in America on a regular basis. I could talk about this show all day, it does so much, says so much it’s hard for me to stop talking about it. Random Acts of Flyness comes on HBO and I’m really looking forward to Season 2! 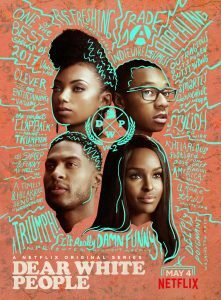 Another great show I’d like to mention is Dear White People. Shout out to Justin Simien for creating the movie and then diving into exploring the complexities of blackness and self identity at a predominantly white university on the show. 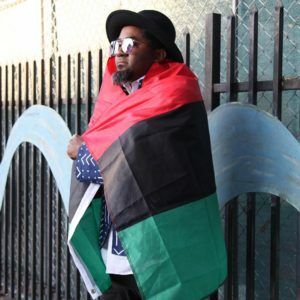 It started with exposing a black face halloween party in the movie(which also happened in real life at a plethora of universities) and in the show, continued to touch on topics like police brutality (in this case campus security & over-policing), secret societies, and the challenges with navigating young adulthood. Shout out to DeRon Horton who takes on the role of Lionel Higgins, he went to my alma mater (SCAD). Dear White People is a Netflix original, don’t be afraid to check it out. Insecure, starring its creator Issa Rae, takes us on a journey through the highs and lows of the various relationships of black women and men in their 20s-30s. The setting of the ever-changing gentrified Inglewood neighborhood of L.A. sets the tone for the ever-changing realities of the main characters. Shout out to Issa Rae for her creative genius and progress from her hilarious mini-series Adventures of Awkward Black Girl to her own show on HBO. 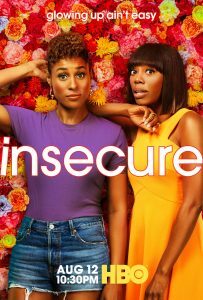 She also continues to produce original work outside of her acclaimed show Insecure so don’t hesitate to support her in her craft. Another show I am patiently waiting for the second season to be released is Spike Lee’s She’s Gotta Have It. 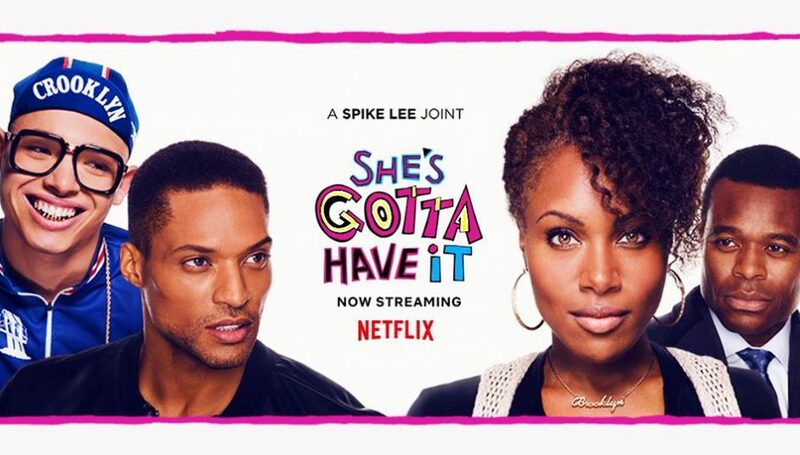 This Netflix original is a more in depth adaptation of Spike Lee’s first film of the same name. This show openly explores the spectrum of sexuality, body image, and self love/worth/value. The main character Nola Darling, a 20 something, navigates her craft as a painter and liberated love life in the ever changing gentrified Brooklyn neighborhood she resides in. Shout out to Spike Lee and his wife Tonya Lewis Lee for bringing this story to a contemporary reality. It is highly relatable and like the other shows it touches on aspects of blackness that people might not talk about or simply know about. 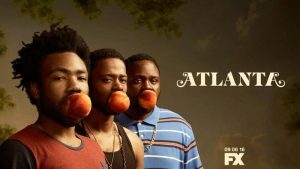 The last show I’ll mention, even though it certainly is not the last show to consider, is Donald Glover’s Atlanta. If that show doesn’t highlight nuances and components of the black experience in Atlanta (particularly amongst the music industry) I don’t know what it’s about. It might go over people’s heads sometimes but it is very rich content that tells narratives that need to be told and I can’t wait to consume more. 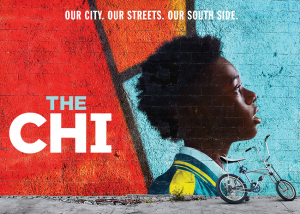 Shoutout to Lena Waithe and her show The Chi, which is also incredible in its representation and narratives. One of our brand ambassadors, AJ Carr has a recurring role on the show. In music there is so much beautiful work to talk about that delves into this in the most empowering ways. Here are a few of the many works that speak to nuances in music amongst our culture. Janelle Monae’s album Dirty Computer including the stunning e-motion picture. Kendrick Lamar’s album To Pimp a Butterfly is a great illustration of black nuances/experiences but I also feel that way about all of his bodies of work so be blessed with his greatness. J. Cole’s album K.O.D. is what I consider to be a continuous double entendre. That project along with anything associated with him continues to speak volumes to the black experience and his genius. 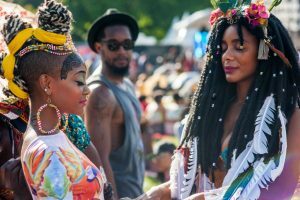 These artists are not all there is to highlighting the nuances of the African diaspora through music. There’s Noname, Saba, Chance the Rapper, PIO’s own Ryan Lucas and so many more artists that might not be blared on the radio but have something substantial to say and express it often in timeless or continuously relatable ways. This list of related content is vast and endless. All forms of art typically reflect the zeitgeist of that era. So listen mindfully to all and see all that we do now, have been doing, and continue to do as a collective of a variety of shades of brown and be prepared to be blown away. We might assume the identity imposed upon us as black, and we might empower and celebrate it, but maybe one day we will evolve to recognize our blackness as something far more beautiful than just complexion. Or maybe we can repurpose the recognition of our blackness as a richness of color and culture. Dark can be considered melanin rich, and we can begin to see the beauty in all of the nuances of our blackness that continue to be seen through content we create that tells our stories to the world beyond our eyes. It’s important to see yourself in a positive light for others to begin to do so. Shout out to all the magical black people in the world, never stop being great! Stay empowered!